Around the Ak Orda, the presidential palace with its blue cupola, are a number of buildings some of which are for governmental functions. 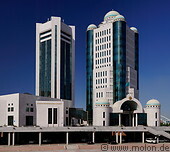 The house of ministries contains the offices of the Kazakh ministries. Near the presidential palace there are the Senate and the Supreme Court buildings. 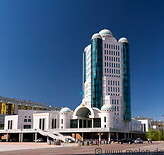 On both sides of the Ak Orda are two tall golden conical towers. The green-blue Central Concert Hall has a very special flower petals shape and was inaugurated in 2009.